After the lukewarm reception to ‘Mass Effect: Andromeda’ a few years ago, a lot of Bioware fans were pinning there hope on ‘Anthem’, a multiplayer/RPG hybrid looter shooter. From when it was originally shown years ago there was a lot of promise in the game and also a lot of hope from RPG fans around the world that it would be able to compete with the likes of ‘Destiny’ and ‘The Division’. I’m going to start by saying that on a purely graphics side the game is utterly beautiful, whether you’re flying around in the open world or walking through your main hub, a gorgeously rendered city. This really is something that ‘Anthem’ does well, and the main characters you interact with are also very well done, with amazing attention to detail and great facial animations (unlike ‘Mass Effect: Andromeda’). Sure, the world is pretty, but what’s the point of a beautiful game without anything to actually do within it? ‘Anthem’ has a main story campaign which will take you between 15 and 20 hours to complete and it includes some exciting missions, however, these are intertwined with some awful trials which just seemed to me like padded outside content with no real purpose. I got the feeling they were shoehorned in purely to increase the length of the main game, which isn’t particularly inspiring. These types of games are supposed to shine with this extra content once the main story is completed, but sadly ‘Anthem’ lacks in this respect. There is no raid at launch and only a few strongholds (known as strikes in the ‘Destiny’ series) which are all repeatable, but after a few hours of doing the same grind and with a roadmap of content for the next 90 days just released by Bioware showcasing little to be playing the game for, I am still a little concerned about what I will be doing in the next few months. The gameplay, however, can be quite exhilarating – your character is human but plays the majority of the game locked up inside a Javelin, a highly capable suit that can exhibit incredible feats of athleticism and fly around like Iron Man. You have a vast array of weapons and abilities which are all interchangeable based on the loot drops from fallen enemies and caches within the world. This brings about a whole other issue though – for some reason, the developers decided it would be a good idea to only allow gear/ability changes whilst in the main hub, which is infuriating and leads to a myriad of loading screens (which I assumed we were trying to move away from, but obviously not everyone follows this line of thought). 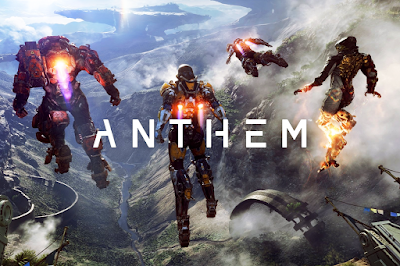 I think the problem is that ‘Anthem’ feels like it should have come out about four years ago. The developers haven’t learnt from the mistakes that games like ‘Destiny’ and ‘The Division’ made, even though these are being rectified by their own developers in the latest releases. This leads it to fall short of its competitors and makes it feel like a lesser version of them. I’m hoping that in time there will be updates and content releases from Bioware that will be able to fix these gameplay issues, and hopefully ‘Anthem’ will eventually become the full package we were all expecting. At launch, there just haven’t been enough for us to play with and despite being given a glimpse of something that could be incredible, it just doesn’t feel like a finished product.